In 1887, Antonio Bertoni, a South American scientist, observed Indians of the Guarani tribe of Paraguay who used Stevia to flavor bitter tribal beverages. Bertoni erroneously classified Stevia as a member of the daisy family, but it was later re-assigned to the chrysanthemum family in 1905. Twenty-five years later, two French chemists conducting research on Stevia isolated the primary constituents responsible for Stevia's properties and named them steviosides. Our Stevia Exttract is based on this research. Today, Stevia is cultivated in over a dozen countries worldwide. It is a major export product and is widely used in countries such as China, Brazil, North and South Korea, Taiwan, Israel, Paraguay and Malaysia. Stevia has also been grown successfully in California, southern Ontario, Canada and even southern England. Although there are several different species of Stevia, the most potent and effective seems to be Stevia rebaudiana, and this species is used in most dietary supplements on the market today. A sweet secret cannot be kept forever! Suggested Use: As a dietary supplement, take one packet daily as desired. 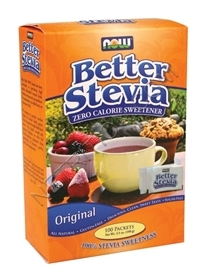 Stevia Extract is a dietary supplement.